"This is the message from the one who holds the seven stars in his right hand and who walks among the seven gold lampstands. 2 I know what you have done; I know how hard you have worked and how patient you have been. I know that you cannot tolerate evil people and that you have tested those who say they are apostles but are not, and have found out that they are liars. 3 You are patient, you have suffered for my sake, and you have not given up. 4 But this is what I have against you: you do not love me now as you did at first. 5 Think how far you have fallen! Turn from your sins and do what you did at first. If you don't turn from your sins, I will come to you and take your lampstand from its place. 6 But this is what you have in your favor: you hate what the Nicolaitans do, as much as I do. "This is the message from the one who is the first and the last, who died and lived again. 9 I know your troubles; I know that you are poor—but really you are rich! 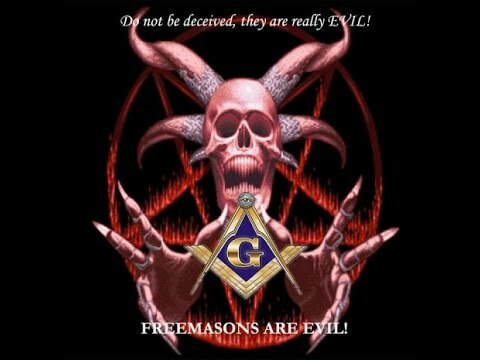 I know the evil things said against you by those who claim to be Jews but are not; they are a group that belongs to Satan! 10 Don't be afraid of anything you are about to suffer. Listen! The Devil will put you to the test by having some of you thrown into prison, and your troubles will last ten days. Be faithful to me, even if it means death, and I will give you life as your prize of victory. 11 "If you have ears, then, listen to what the Spirit says to the churches! "This is the message from the one who has the sharp two-edged sword. 13 I know where you live, there where Satan has his throne. You are true to me, and you did not abandon your faith in me even during the time when Antipas, my faithful witness, was killed there where Satan lives. 14 But there are a few things I have against you: there are some among you who follow the teaching of Balaam, who taught Balak how to lead the people of Israel into sin by persuading them to eat food that had been offered to idols and to practice sexual immorality. 15 In the same way you have people among you who follow the teaching of the Nicolaitans. 16 Now turn from your sins! If you don't, I will come to you soon and fight against those people with the sword that comes out of my mouth. 17 "If you have ears, then, listen to what the Spirit says to the churches! 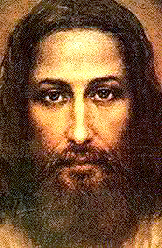 "This is the message from the Son of God, whose eyes blaze like fire, whose feet shine like polished brass. 19 I know what you do. I know your love, your faithfulness, your service, and your patience. I know that you are doing more now than you did at first. 20 But this is what I have against you: you tolerate that woman Jezebel, who calls herself a messenger of God. By her teaching she misleads my servants into practicing sexual immorality and eating food that has been offered to idols. 21 I have given her time to repent of her sins, but she does not want to turn from her immorality. 22 And so I will throw her on a bed where she and those who committed adultery with her will suffer terribly. I will do this now unless they repent of the wicked things they did with her. 23 I will also kill her followers, and then all the churches will know that I am the one who knows everyone's thoughts and wishes. I will repay each of you according to what you have done. 24 "But the rest of you in Thyatira have not followed this evil teaching; you have not learned what the others call "the deep secrets of Satan.' I say to you that I will not put any other burden on you. 25 But until I come, you must hold firmly to what you have. 26 To those who win the victory, who continue to the end to do what I want, I will give the same authority that I received from my Father: I will give them authority over the nations, to rule them with an iron rod and to break them to pieces like clay pots. I will also give them the morning star. 29 "If you have ears, then, listen to what the Spirit says to the churches! 12 And I saw the Lamb break open the sixth seal. There was a violent earthquake, and the sun became black like coarse black cloth, and the moon turned completely red like blood 13 The stars fell down to the earth, like unripe figs falling from the tree when a strong wind shakes it. 14 The sky disappeared like a scroll being rolled up, and every mountain and island was moved from its place. 15 Then the kings of the earth, the rulers and the military chiefs, the rich and the powerful, and all other people, slave and free, hid themselves in caves and under rocks on the mountains. 16 They called out to the mountains and to the rocks, "Fall on us and hide us from the eyes of the one who sits on the throne and from the anger of the Lamb! 17 The terrible day of their anger is here, and who can stand up against it?" 3" I will send my two witnesses dressed in sackcloth, and they will proclaim God's message during those 1,260 days." 4 The two witnesses are the two olive trees and the two lamps that stand before the Lord of the earth. If anyone tries to harm them, fire comes out of their mouths and destroys their enemies; and in this way whoever tries to harm them will be killed. 6 They have authority to shut up the sky so that there will be no rain during the time they proclaim God's message. They have authority also over the springs of water, to turn them into blood; they have authority also to strike the earth with every kind of plague as often as they wish. 7 When they finish proclaiming their message, the beast that comes up out of the abyss will fight against them. He will defeat them and kill them, 8 and their bodies will lie in the street of the great city, where their Lord was crucified. The symbolic name of that city is Sodom, or Egypt. 9 People from all nations, tribes, languages, and races will look at their bodies for three and a half days and will not allow them to be buried. 10 The people of the earth will be happy because of the death of these two. They will celebrate and send presents to each other, because those two prophets brought much suffering upon the whole human race. 11 After three and a half days a life-giving breath came from God and entered them, and they stood up; and all who saw them were terrified. 12 Then the two prophets heard a loud voice say to them from heaven, "Come up here!" As their enemies watched, they went up into heaven in a cloud. 13 At that very moment there was a violent earthquake; a tenth of the city was destroyed, and seven thousand people were killed. The rest of the people were terrified and praised the greatness of the God of heaven." 1 Then a great and mysterious sight appeared in the sky. There was a woman, whose dress was the sun and who had the moon under her feet and a crown of twelve stars on her head. 2 She was soon to give birth, and the pains and suffering of childbirth made her cry out. 3 Another mysterious sight appeared in the sky. There was a huge red dragon with seven heads and ten horns and a crown on each of his heads. 4 With his tail he dragged a third of the stars out of the sky and threw them down to the earth. He stood in front of the woman, in order to eat her child as soon as it was born. 5 Then she gave birth to a son, who will rule over all nations with an iron rod. But the child was snatched away and taken to God and his throne. 6 The woman fled to the desert, to a place God had prepared for her, where she will be taken care of for 1,260 days. 7 Then war broke out in heaven. 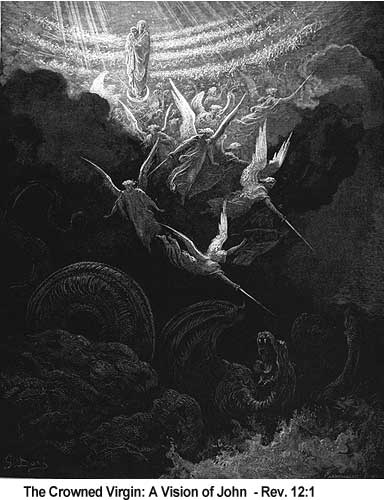 Michael and his angels fought against the dragon, who fought back with his angels; 8 but the dragon was defeated, and he and his angels were not allowed to stay in heaven any longer. 9 The huge dragon was thrown out—that ancient serpent, named the Devil, or Satan, that deceived the whole world. He was thrown down to earth, and all his angels with him. 10 Then I heard a loud voice in heaven saying, "Now God's salvation has come! Now God has shown his power as King! Now his Messiah has shown his authority! For the one who stood before our God and accused believers day and night has been thrown out of heaven. 11 They won the victory over him by the blood of the Lamb and by the truth which they proclaimed; and they were willing to give up their lives and die. 12 And so be glad, you heavens, and all you that live there! But how terrible for the earth and the sea! 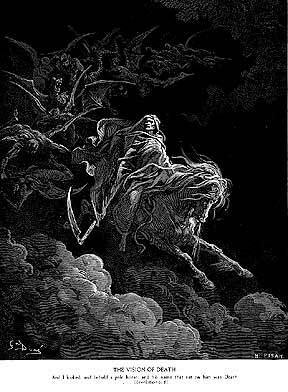 For the Devil has come down to you, and he is filled with rage, because he knows that he has only a little time left." 13 When the dragon realized that he had been thrown down to the earth, he began to pursue the woman who had given birth to the boy. 14 She was given the two wings of a large eagle in order to fly to her place in the desert, where she will be taken care of for three and a half years, safe from the dragon's attack. 15 And then from his mouth the dragon poured out a flood of water after the woman, so that it would carry her away. 16 But the earth helped the woman; it opened its mouth and swallowed the water that had come from the dragon's mouth. 17 The dragon was furious with the woman and went off to fight against the rest of her descendants, all those who obey God's commandments and are faithful to the truth revealed by Jesus. 18 And the dragon stood on the seashore. 1 Then I saw a beast coming up out of the sea. It had ten horns and seven heads; on each of its horns there was a crown, and on each of its heads there was a name that was insulting to God. 2 The beast looked like a leopard, with feet like a bear's feet and a mouth like a lion's mouth. The dragon gave the beast his own power, his throne, and his vast authority. 3 One of the heads of the beast seemed to have been fatally wounded, but the wound had healed. The whole earth was amazed and followed the beast. 4 Everyone worshiped the dragon because he had given his authority to the beast. They worshiped the beast also, saying, "Who is like the beast? Who can fight against it?" 5 The beast was allowed to make proud claims which were insulting to God, and it was permitted to have authority for forty-two months. 6 It began to curse God, his name, the place where he lives, and all those who live in heaven. 7 It was allowed to fight against God's people and to defeat them, and it was given authority over every tribe, nation, language, and race. 8 All people living on earth will worship it, except those whose names were written before the creation of the world in the book of the living which belongs to the Lamb that was killed. 9 "Listen, then, if you have ears! 10 Whoever is meant to be captured will surely be captured; whoever is meant to be killed by the sword will surely be killed by the sword. This calls for endurance and faith on the part of God's people." 11 Then I saw another beast, which came up out of the earth. It had two horns like a lamb's horns, and it spoke like a dragon. 12 It used the vast authority of the first beast in its presence. It forced the earth and all who live on it to worship the first beast, whose wound had healed. 13 This second beast performed great miracles; it made fire come down out of heaven to earth in the sight of everyone. 14 And it deceived all the people living on earth by means of the miracles which it was allowed to perform in the presence of the first beast. The beast told them to build an image in honor of the beast that had been wounded by the sword and yet lived. 15 The second beast was allowed to breathe life into the image of the first beast, so that the image could talk and put to death all those who would not worship it. 16 The beast forced all the people, small and great, rich and poor, slave and free, to have a mark placed on their right hands or on their foreheads. 17 No one could buy or sell without this mark, that is, the beast's name or the number that stands for the name. 18 This calls for wisdom. Whoever is intelligent can figure out the meaning of the number of the beast, because the number stands for the name of someone. Its number is 666.